So I was wandering around a citywide garage sale and saw that a bar was selling all of its close out merchandise at breakneck prices. For 20 bucks I got a nice lot of autographed memorabilia, so I didn’t think it’d be a bad deal to get- even if they were bad considering how much they’d cost in real life. I started a new binder where I kept photo and other types of autographs than cards. 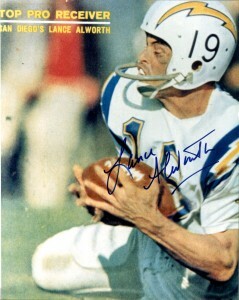 Well, Lance Alworth is a class of 1978 Hall of Fame receiver that played his career for the San Diego Chargers and Dallas Cowboys. Nicknamed “Bambi” by his teammates because of his almost effortless moves he was originally drafted by the Oakland Raiders, who almost immediately traded to the Chargers where he played the majority of his career from 1962 to 1970, often playing quietly through injury including fractures to both of his hands in 1966. 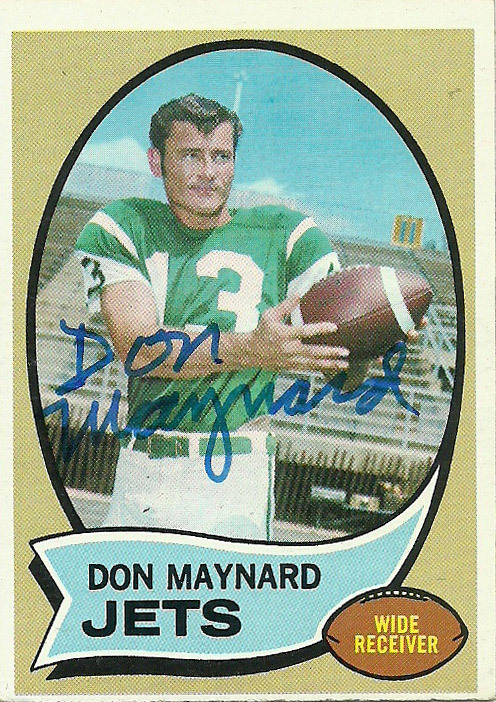 He was named an AFL All Star 7 times, and lead the AFL in yardage 3 seasons ( 1966, 1968, and 1969). 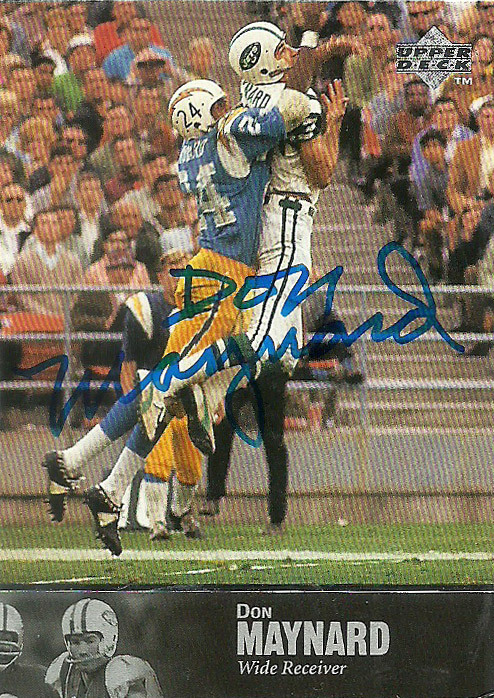 After the 1970 season he was traded to the Cowboys where he scored the first touchdown in Superbowl VI and afterwards subsequently retired with both an AFL championship ring and a Superbowl ring. Things have been slightly rough for Alworth. Players of that day and age weren’t paid like they are now, and he had a bad patch there. Since the mid seventies Alworth has opened a series of storage units across California. He’s been also inducted into the Chargers Hall of Fame (1977), San Diego Hall of Champions (1972), his number (19) was retired by the Chargers, named to the NFL’s 75th anniversary team, the College Football Hall of Fame (1984), the AFL All-Time Team, the Mississipi Sports Hall of Fame, and finally was named number 31 on the 100 Greatest Football Players of all time list from “The Sporting News”.